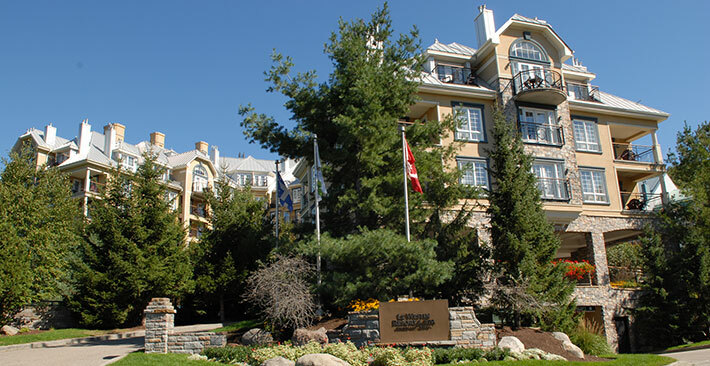 The renovation project at the Westin Resort & Spa, one of Tremblant’s upscale lodging establishments located at the heart of the pedestrian village, is continuing. It resumed in April 2014, after a three-month break. During this phase, public spaces such as the lobby, front desk, meeting and banquet rooms, and common bathrooms will be renewed. Work will extend until the end of summer. To preserve a calm environment and to maintain proper service, the entire front desk area has been covered and hotel personnel are greeting guests from a purpose-built temporary station. Once completed, the redesigned lobby will boast new wall and floor finishes, modern furniture, and an astonishing “green wall”. A signature feature of the new Westin lobby, the Vertical Garden has been specifically designed to help guests feel balanced and inspired. On the other hand, the hotel’s business facilities and meeting rooms will see the installation of new floor and wall finishes, light fixtures and decorative elements. The first floor bathrooms will also undergo a complete makeover which includes new counters, wall finishes and floor coverings, amongst others. Phase 2 is part of a $5M investment into the interior design and guest experience at this Starwood Hotels & Resorts Worldwide Inc. member establishment. Befitting the signature banner, the concept is warm, timeless and elegant. Inspiration is drawn from surrounding nature with an emphasis on noble materials vested with eco-friendly properties. Rich energizing textures in a palette of luxurious, soothing neutrals are presented in an authentic, sophisticated approach. As with Phase 1, interiors were entrusted to Starwood authorized firm Robert J. Chaban & Associates, while the work is being overseen by Groupe Marchand Design & Architecture. Phase 2 is slated to be completed by September 2014.